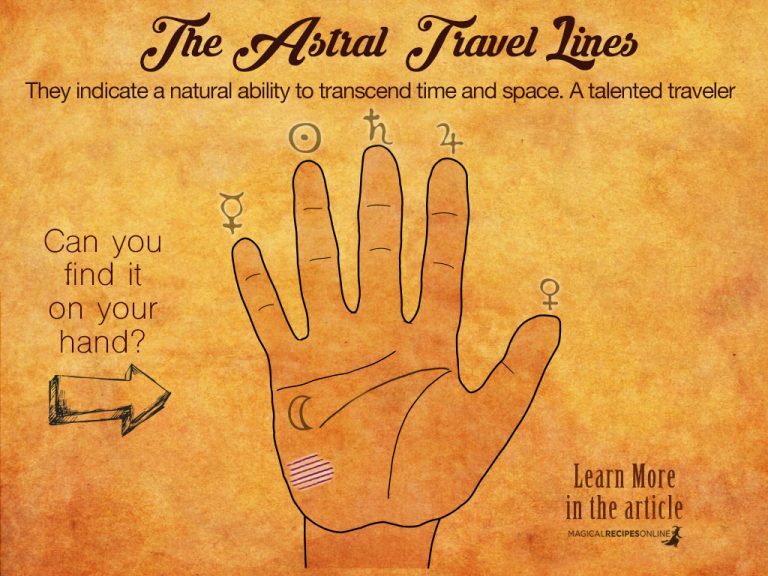 Palmistry is a very powerful source of valuable information. It gives us insight for both our physical and our eternal body. There are Palm signs which help us understand more about our Romantic life and future marriage(s). Moreover there are signs which show us where are we good at. Both our talents and inclines “carve” peculiar palm signs. This is a list of 5 important palm signs which indicate a powerful born witch. See here more about the Life Line of your hands. How many of these Palm signs should I have to be a Born Witch? You don’t have to have them all. In fact you don’t have to have anything at all. Being a Witch usually comes without any sign. However, there are many cases when these marks – probably coming from another life – remind us the power we once had. These signs are in general called Witch Marks. They have been known to indicate a Born Witch. 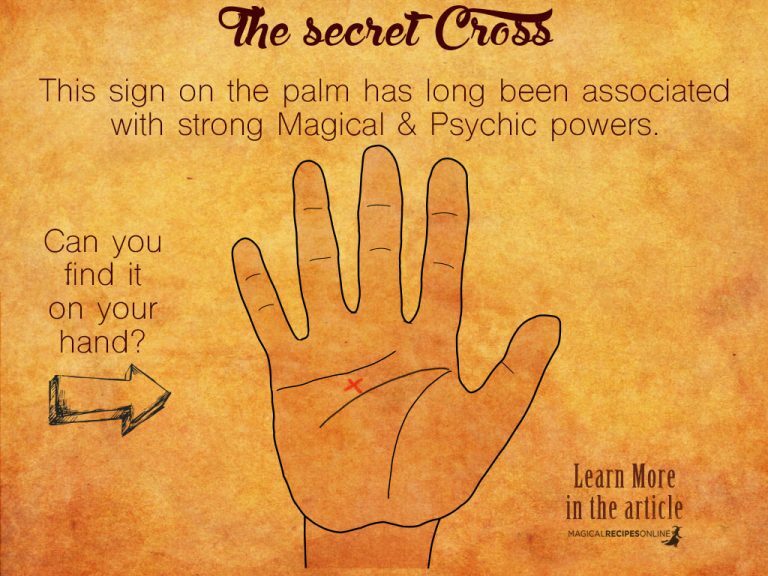 Maybe one of the most powerful Palm Signs is the Secret Cross – Mystic Cross. This is a cross or X shaped sign – which is located between the heart life and the head line. See the picture. People who have these palm signs are considered to know their magical powers since a very young age. I’ve met many mages and witches with the Secret Cross. When I spot it, I feel like I know this person from the Astral World. We are all “spiritually” related. Moreover, they have a natural incline to the occult sciences and arcane wisdom. They have a strong intuition making them powerful witches. Do you have it ? Let us know! 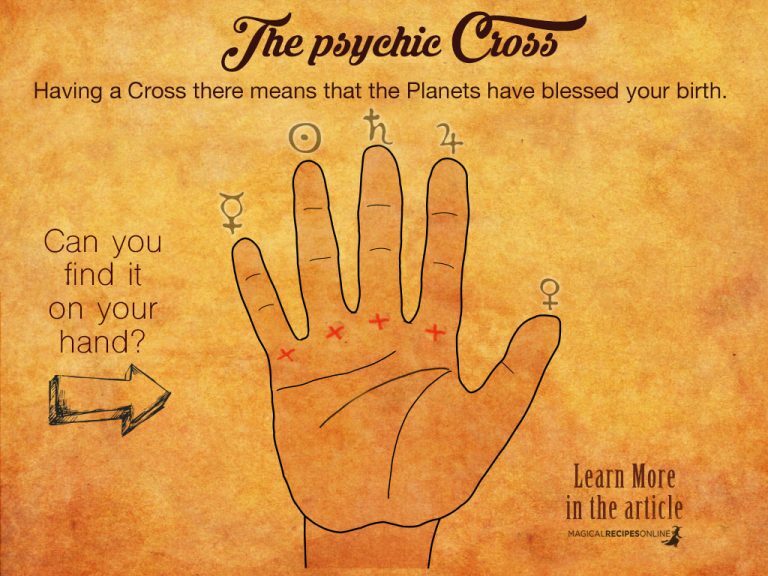 Amongst the Palm signs we believe that the Psychic cross is really important. There are signs located on the root of each finger. Each finger represents a different planetary entity. Therefore, when a psychic cross is found we should correspond the finger with the appropriate planet and see what it means. Index Finger. This is the finger of Jupiter. Therefore, the psychic cross on this finger means that good luck of the Jupiter is by your side. The magical opportunities will arise which are going to help you reach for success. It also means that you have an uncanny capacity for magical wisdom. You can become very powerful as you have the ability to absorb powerful knowledge. Wise Teachers are attracted by you. Later in your life you are destined to become a magical teacher. Middle Finger. This is the finger of Saturn. Thus, if a psychic cross is found there you are blessed by Saturn – the planet of Witches. You have the ability to learn through both the easy and the tough way. Moreover, you have been blessed by a hard and strict teacher but you learn Magic through your experiences. You will discover your extremely great power capacity once you’ve found some quality time for yourself. Meditation works miracles for you as well as Dream Magic! Mark my words! Ring Finger. This is the finger of the Sun. Therefore, if you spot a cross there, you are blessed by Sun and Apollo, the God of Magic and Prophecy. You have the power to attract what you need in your life. You are an enchanter / enchantress. This means that your love life can become an inspiration in your magical activities. When you are sexually active you find enlightenment – through the pleasure. Tap into the Solar Power. Little Finger. This is the finger of Mercury. Of course this changes everything. Mercury is the planet associated with all magical works and divination. Since young age, you’ve met the magical world. Therefore, if you are blessed with this sign you are born to love magic and be good at it. It means my dear that Mercury – Hermes, the wise god, has blessed your birth making you a powerful mage / witch. Use your brain and your heart to develop your magical abilities. 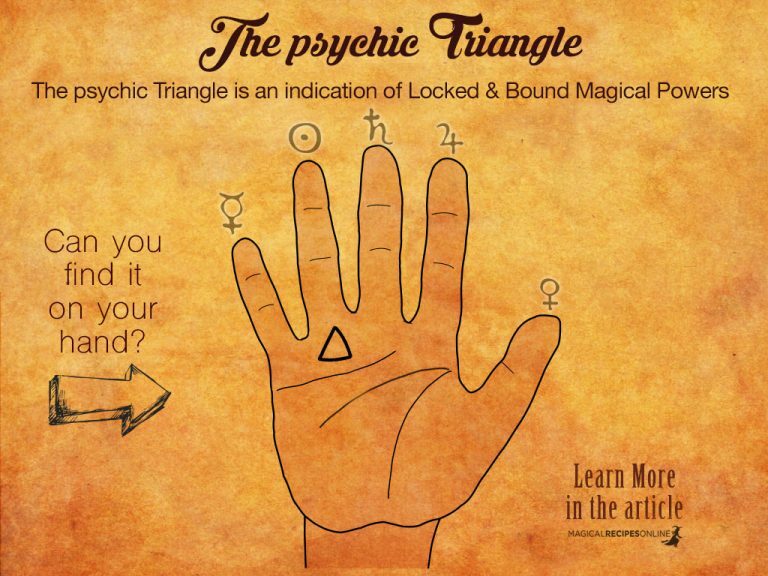 A pyramid like – triangle shaped sign on the ring finger is the Psychic Triangle. Look closer, this sign may not be that obvious. The palm signs might be pale and hard to notice. Have you found it? 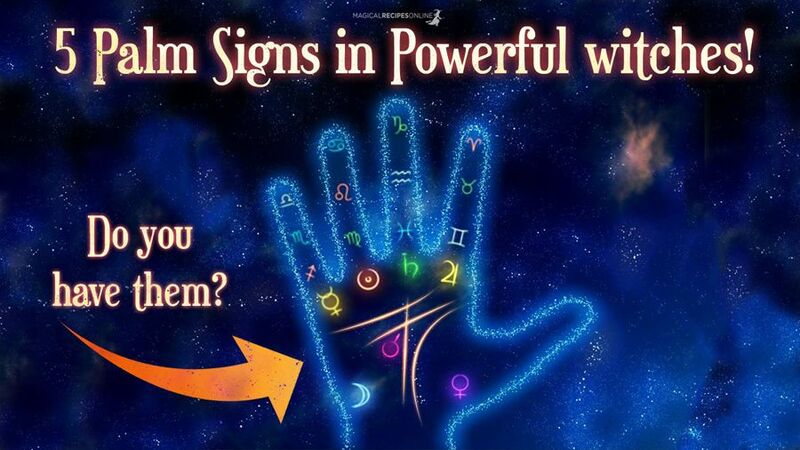 This means that for some reason you have – intentionally or unintentionally blocked these powers. Some times, we – our higher selves to be exact – block our magical powers when we have committed “magical crimes” in our past lives, or we used our magic for dark purposes. This is a defence mechanism so that we don’t hurt ourselves more. Every-time we cast a “dark” spell to hurt someone and/or intervene to someone’s free will, we create bad karma. 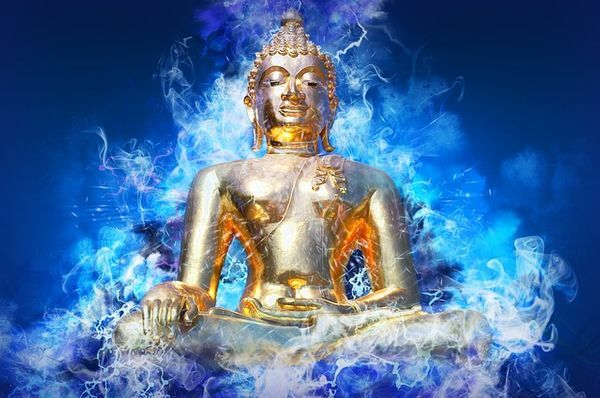 This bad karma eventually comes back to us – see here all about Karma. The Psychic Triangle – more like psychic prison, is where our magic is jailed. These palm signs may also mean that someone else has bound our powers. This may probably mean that we have created some enemies in our past lives. The key to unlock our powers is love and acceptance of ourselves and others. We can easily become pwoerful withces once again when we forgive the others and ourselves. Of course a spell breaking ritual – cleansing and a power awakening spell will help! Four or more parallel lines on the bottom On the bottom of the little finger is an indicator that this person is a powerful healer. 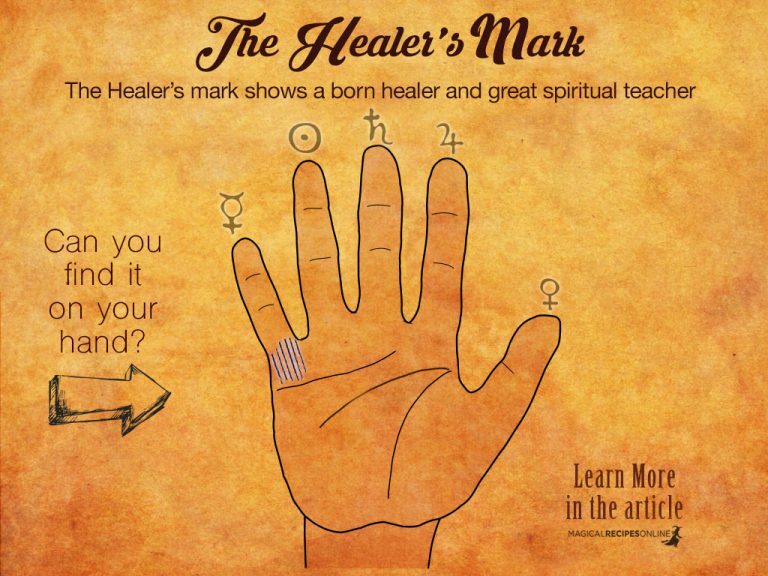 It means that the barrier of the healers mark has the great ability to touch the Hearts of people and find ways to heal their scars both emotional and physical. Today these people are medical doctors psychologists and life coaches. They’ve chosen the path of healing in order to help others either by profession or by hobby. We could say that these marks on our hands are like the medals of Mercury – Hermes, god of communication and healing. 4-5 lines indicate a powerful healer, 6-7 lines indicate someone who is destined to become a healer, 8 and more show someone who have mastered in previous lives – and this one probably – the art of Healing. The more the lines, the more the gifts. Of course to master the art of Healing, requires practice and to be a good listener. Like gold wise healers you need to master the art of grounding and centring. Under the Mount of the Moon, these palm signs indicate a natural ability to transcend time and space. You travel to the astral plane more than you know! This is a person who is born to travel in both physical and astral planes. 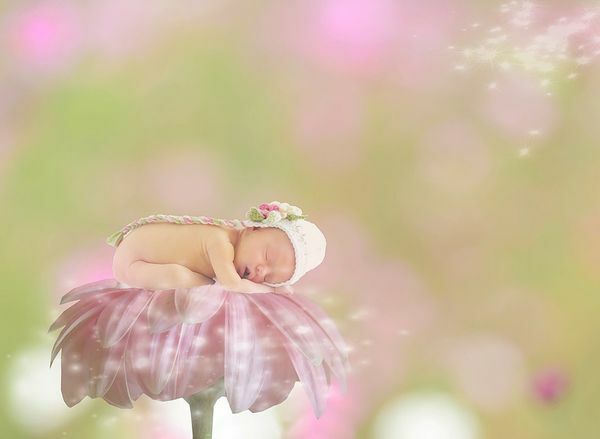 The one who is born with the Astral Travel lines have a natural ability to become a great mage / witch as he/she can project in the astral plane. Shamans, witches and mages travel in the astral plane so that they can get more information. From the astral plane they can heal, they can cast spell and chat with fairies and other entities. You are an astral mage! Do You Have them? Good! All pictures (for which we own no copyright) were taken from the source.